I gather there are several variations of this soup from the island of Panay. Simple chicken broths, sometimes cooked in fresh bamboo, now mostly done in a typical pot on a stove. Vegetables included can vary based on what’s in the backyard. 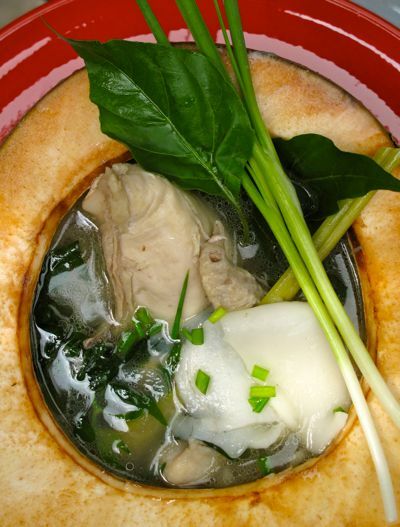 Some would say this is simply a version of tinola, a chicken soup enjoyed in many other parts of the country. But the Binakol with young coconut meat and water is the soup that I seem to favor the most. I have been tinkering with our Binakol recipe recently and am quite happy with the version I have today. We served the soup in coconut shells for lunch the other day and it was an extremely elegant way to present what is really more like a “peasant” soup. If you leave the coconut meat in the shell, guests can scrape off as much or as little as they want. looks like this one will be included in your cook book. very nice presentation. bravo. Hi MM! I would love to try this binakol, however i dont like ginger at all. What could be a possible replacement for it? My relatives are from Quezon Province and my Children’s Ministry is based there. I go every year, and dishes I have eaten are mostly cooked in “gata”, but never I had eaten this, in roadside eatery, or had been served to me by the folks we visit. I sure would try to cook this dish (in fact, today I cooked something like this using beef bones), but my problem is the fresh coconut. They sell buko slices (with its own juice) in a can.. I wonder if this work. Coconut & I don’t get along, but your photograph makes me willing to ignore the consequences and want to cook this! Beautiful presentation & photography MM! We Ilonggos enjoy our local binakol but your improved version with a twist looks really good. I hope the recipe will be included in the cookbook. this is really yummy. i would love to try this menu. I love this soup and serve it like this at home too! I didn’t think to serve it with patis. Thanks for the tip. 4 posts in 3 days! you’re back with a vengeance, MM. Namit gid ini – always request for it on rare trips back to Bacolod. Bisaya nga manok that is free ranging around the backyard is especially good. Sarap! I’ve never tried binakol with coconut milk. Time to. And nice pictures as usual, MM! I love my wife’s version too, with kamatis. My sawsawan (dipping sauce) is a mixture of patis (fish sauce) and Tabasco (!). This is my grandmother’s favorite soup…and I love it too. Fabulous first photo…definitely cookbook worthy! It is soup weather here now so I was inspired to do this Chicken Binakol…Thanks, MM! It was supposed to be like tinola but it ended up like aThai Binakol, MM….added a few lime leaves and galanggal sitting in the freezer, a few tbsp. of Tom yam paste, and coconut cream at the end. Instead of the fresh coconut, I used the frozen coconut shell with the juice and meat still intact and way easier to work with. I found it at Asian store here at T and T.
It just hit the spot!….will do this again on the week-end! Tintin…have you tried galanggal? if you usethe tip of the tuber (not the fibrous end) it is milder and a tad sweeter.I have used it in some dishes that calls for ginger. A very dear friend, MC, in LA turned me to a galanggal convert! MM… have you heard from MC? Sorry for the typo…it was supoosed to be…tom yum paste! killer presentation!those tiny buco they sell in bangkok streets would make for very nice individual servings of this! i’ve always thought of doing this (with buco juice, and in a buco shell) but have never done so…will definitely do within the next few daya! as for the tinola itself, plenty of ginger and a few pieces of lemongrass in the broth does this for us, plus a lot of chili in the dipping sauce. once i put in a few pieces of tiny fresh straw mushrooms, and it turned out very well, too. i’ve seen some provincial carinderias put slices of sweet red peppers, but it just doesn’t cut it. Hot soup to warm the rainy days. Sarap!. Is there a difference between tinola vs binakol? is it the buko juice and meat that makes it binakol? @ betty q., salamat po but i’ve never heard of it until now.. pasensya na po..
bettyq, maria clara dropped a bagful of guavas to my apartment last Friday, she was in a hurry so we did not talk that long just hi’s and thank you’s . the guavas are good manibalang and shared them with the other apartment dwellers since its rent payment time everybody who went to the office gets a handful of guavas. The El Salvadorans love it. Marilen–namit gid man..I was about to add “native chicken” but I saw your post..here we have to be contented with freshly butchered meats in local small shops..they do taste better! Norma–yes, it’s the buko juice and buko meat…otherwise, it’s just plain tinola, which is also good! i love it with pepper-leaves and green papaya. I just love the presentation, serving it in the coconut shell. It is best to use “native ” chicken for binakol, with lots of ginger to neutralize the malansa smell inherent to the chicken. MM, off topic – but have you seen the Assumption 79 cookbook yet ? I adore this presentation and would make a good bet that this would really take off in the more upscale Filipino restaurants (ie/ Bistro Luneta) here in the bay area. Rather than use the young coconut as the serving vessel, I wonder if the product would take on a different flavor profile if the soup was prepared in the coconut itself and then steamed over time. Natie, thanks. 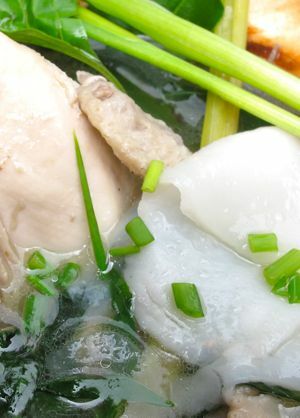 I have a native chicken in the freezer and plan to make binakol with green papaya and sili leaves this week end. 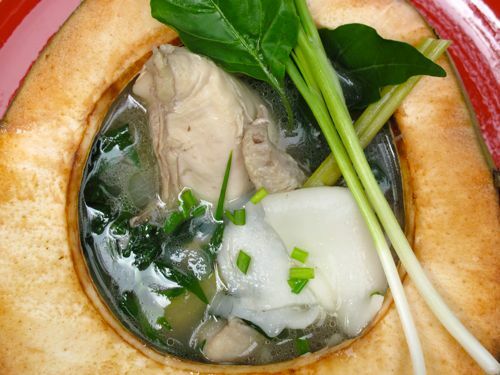 I’ve never tried this before but it sounds intriguing… coconut juice soup with chicken? hmmm. Who would have thought the combination is possible? My mom and I have been searching for this recipe. It’s one of those Lola’s recipes we never learned to make. We will try this for sure. Thanks!